The ‘On With the Show’ tour will get underway across Europe in May 2015, following its so-far-successful US leg. The first show will take place on the 27th of May 2015 at the O2 London and, after some dates on the Continent, will come to Birmingham, Manchester, Glasgow and Dublin before culminating in Leeds on the 30th of June. Tickets go on general sale this Friday (14th September) at 9.00am via Ticketmaster. Prior to this, fans can purchase O2 Priority pre-sale tickets today (12th September) and Live Nation pre-sale tickets from 9.00am tomorrow (13th September). Fleetwood Mac, who first found success as a blues-rock outfit in the mid-late sixties under the leadership of British guitarist Peter Green, went on to find success as a pop-rock act in the mid-seventies after founding members Mick Fleetwood and John McVie (alongside McVie’s then-wife Christine) teamed up with Californian folk duo Buckingham Nicks. 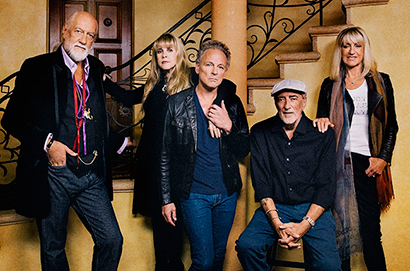 The result of this combination of British rock and laid-back West Coast folk was the Fleetwood Mac that went on to enjoy one of the best-selling albums of all time – Rumours – and an extensive back catalogue of hits such as ‘Go Your Own Way’, ‘Don’t Stop’, ‘Rhiannon’, ‘Big Love’, ‘Dreams’ and the classic theme tune for BBC’s Formula 1 coverage, ‘The Chain’. It’s been 16 years since the Rumours-era line-up of Fleetwood Mac were on stage together and ‘On With the Show’ will give fans the chance to see hits played by the legendary line-up, with the band reportedly being on top form in the US. The group recently performed two sold out shows at Madison Square Garden and added 28 extra dates to their US tour.